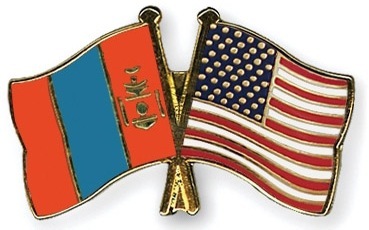 Mongolia and United States established diplomatic relations on 27 January 1987. Incumbent Ambassador of Mongolia to the USA, His Excellency Mr. Bulgaa Altangerel presented his Letter of Credence to President Barack Obama on 14 January, 2013. The US Ambassador to Mongolia, Her Excellency Piper Anne Wind Campbell presented her Letter of Credence to President Ts. Elbegdorj on 24 August 2012. Mongolia made few attempts to establish diplomatic relations with the US since early twentieth century. For instance, the Bogd Khan (then the monarch of Mongolia) Government proposed to establish official ties through the US Embassies in St. Petersburg and Beijing in 1913 and 1914 respectively. In 1921, Mongolia (after the People’s Revolution) also renewed its offer to establish diplomatic relations. From the American side, it appointed a special consular officer in charge of Mongolia at its Consulate in Hubei province of China. American Vice President Henry Wallace visited Mongolia in 1944 during his trip to the USSR and China. This first visit of the high-level dignitary of the USA played an important role in the recognition of status quo of Mongolia at Yalta Conference of Heads of Government of the USA, Great Britain and Soviet Union in 1945. Today the relationship between our two countries continues to grow and strengthen. The leaders of the two countries declared in 2004 “a new era of cooperation and comprehensive partnership between their two democratic countries based on shared values and common strategic interests”. The United States “strongly supports Mongolia’ s democratic and economic transition and reforms and welcomes Mongolia’s progress toward becoming a mature and stable democracy and a private sector-led free market economy”. The U.S. Senate issued a resolution in support of the visit of President Tsakhia Elbegdorj to the United States in June 2011 and its role for the growing partnership between the United States and Mongolia. In a joint statement issued during the visit both sides confirmed their intention to strengthen trade, investment and people-to-people ties so as to support economic growth and deepen the bonds of friendship between their two peoples. In 2012, the two countries celebrated the 25th anniversary of the establishment of diplomatic relations. Both countries were pleased to witness many achievements in bilateral relations and cooperation and confirmed that commercial and economic cooperation has great opportunities to widen, especially in the mining, defense and education spheres. Mongolia is committed to maintaining a comprehensive partnership relations and cooperation with the United States in the framework of its “third neighbor” policy. The United States consistently supports Mongolia’s transition toward democracy, reform and market-oriented economy since the 1990s as well as the U.S. political, economic and humanitarian assistance played an important role in ensuring of common democratic values in Mongolia. The two sides maintain regular exchanges of high level visits and consultations at all levels. The visits of the Presidents of Mongolia in 2007 and 2011 and the Prime Minister of Mongolia in 2008 to the U.S. and the visits of the President George W. Bush in 2005 and U.S. Vice President Joe Biden to Mongolia in 2011, as well as the visits of the Speaker of the US House of Representative in 2005 and Chairman of the State Greta Hural of Mongolia in 2013 significantly contributed to development and expansion of our partnership. The annual bilateral consultations (ABC) between the Ministry of Foreign Affairs of Mongolia and U.S. Department of State has became an effective mechanism for both sides to exchange views on their positions on bilateral, regional and international issues of mutual interest and discusses short-term goals and perspectives of bilateral relations. Eight ABCs took place since 2003 and the 9th is expected to be held in November 2013 in Washington DC. The U.S. is an important trading partner for Mongolia. Total goods trade between Mongolia and the U.S. amounted to US$539.6 million in 2012. This made the U.S. 3rd largest trading partner after China and Russia. Trade deficit with the U.S. totaled US$332.5 million. The U.S. was the 8th largest foreign direct investor as of 2012. The U.S. direct investments into Mongolia reached US$292 million, which were mainly concentrated in mining (38%) and wholesale & retail trade and catering (36%). The MCC Compact Agreement was signed on October 22, 2007 following the Millennium Challenge Corporation awarded Mongolia a $285 million aid program. The Mongolia Compact directed strategic investments to increase economic activity through secure and registered land titles in urban areas, sustainable utilization and management of rangelands in peri-urban areas, and improved vocational and technical training. The Mongolia Compact has been successfully completed on September 17, 2013. The two countries recently signed the Agreement on Transparency in Matters Related to International Trade and Investment between Mongolia and the United States of America, in short the Transparency Agreement. The purpose of the agreement is to promote transparency in policy-making, as well as to facilitate exchange of information between the Governments of the two countries. The Agreement should be ratified by our respective legislative bodies. The relations and cooperation in the defense sector between our countries are successfully developing, particularly in Mongolia’s defense reform, strengthening professional armed forces and improving the capacity of peacekeeping forces. Many Mongolian students have been studying in U.S. universities through the U.S. Agency for International Development, Asia Foundation, Open Society Forum – Soros Foundation, Fulbright Scholarship Program, Humphrey Fellowship Program, non-governmental and religious organizations. For instance, in an effort to expand the educational exchanges, the U.S. Institute of International Education and the Ministry of Education, Culture and Science of Mongolia signed “Scholarship Agreement”. Also more than 400 students educated in the United States through the State Training Loan Fund of Mongolia. In addition, United States Peace Corps have been performing their operation since the 1990s in Mongolia and 870 volunteers have been working for this period.